Mishaps while ironing are pretty common and a burnt shirt or dress can cause severe heartache and great inconvenience. A lapse in concentration can cause the user to burn holes in expensive clothing items. The auto lift iron is a novel invention by Italian-based Ariete to prevent common accidents like this from happening. The Auto Lift iron is incorporated with one-touch technology to enable it to detect the touch of the user’s hand on the handle. If this was not sensed, the iron would automatically lift itself and stop steam from being emitted. When users grab it again, the sensor will detect the touch of a hand and lower itself to continue functioning as usual. This automatic feature will surely help to reduce the chance of burning holes in clothes and even avoid domestic accidents or fires. The auto lift iron also features a stainless steel plate, a detailer to prevent wrinkles around buttons, a thermostat, a pivoting cord, and a see-through water tank. Another useful security feature is the ability to automatically shut off if not in use for 8 minutes. 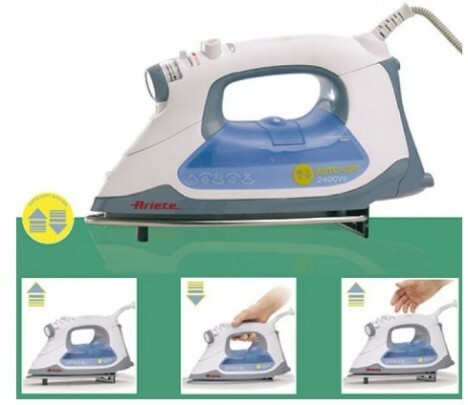 The Auto Lift iron should be much welcomed by hassled homemakers or any other users who have the tendency to be forgetful or distracted when doing household chores. If $92 sounds like it may burn a hole in the pocket, think of the holes it will save in your dinner jacket, party dress, business suit, etc.